Folks, there’s plenty of fun to be had that’s within easy driving distance from the park! Ol’ Buckaroo and I just love gettin’ out to see all the wonderful things this area has to offer. 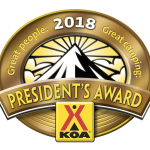 We’re so well-traveled that the good people at Bear Creek Ranch KOA asked us to seek out Website links to the best regional attractions we could find! So here they are, friends. Have a look at some highlights that you can expect when you take your day trips around Bear Creek Ranch KOA! Experience the picturesque emerald green hills and freshly plowed fields. Be charmed by the immaculate red & white barns and winding country roads with horse & buggy riders moving at a leisurely pace. This tranquil scene is just a glimpse of the homespun warmth of Amish Country. Ohio’s Holmes County area represents the largest settlement of Amish people in the world. Ohio’s museum of automobile nostalgia is filled with famous and classic cars from 1904-1981, plus lots of memorabilia! Open daily 10:00am to 5:00pm. Be fascinated by the making, molding, wrapping, packaging and storing of fine chocolate products. Guided one-hour chocolate journey. Open 9:00am to 4:00pm with tours every half hour. Reservations are recommended. One of Ohio’s largest and oldest weekly flea markets. Browse through the many vendors who offer everything from antiques to fresh produce. Open every Mon. and Thurs. Adjacent to the flea market is the Antique Mall. Open daily 10:00am to 6:00pm, closed Sun. LEHMAN’S HARDWARE & APPLIANCES, INC.
Monday thru Saturday 8:00 a.m. to 5:30 p.m. Thursday until 8:00 p.m. This memorial, a historic landmark, is dedicated to William McKinley, the 25th President of the United States. Explore the Natural History Island complete with robot dinosaur. Experience Space Station Earth, a facility that houses numerous interactive exhibits that include a weather station, water and air exhibits, 65 seat planetarium. Open Mon-Sat 9:00am to 5:00pm Sun. 12:00pm to 5:00pm. America’s premier sports showplace features a movie theater, exciting displays, the popular Museum Store plus twin enshrinement halls, where the greats of pro football are honored. The recently expanded Hall features Game Day Stadium – a turntable theater taking each visitor through life in the NFL. Open 9:00am to 5:00pm daily. Visitors who cruise on the St. Helena III travel along an original section of the Ohio & Erie Canal. The boat glides along as it is pulled by a team of horses. Travel back in time to the days when canals were Ohio’s highways. Outdoor drama written by Pulitzer Prize winner, Paul Green, portraying peace, hatred and passion over 200 years ago on the Ohio frontier. Enjoy a priceless collection of beautiful carvings depicting the history of the steam locomotives and steam engines in ivory, ebony, and pearl. Button house and Swiss style gardens are also featured. Zoar was founded in 1817 as a refuge from religious persecution by German immigrants. In 1819, they formed a communal society, where all shared equally. After digging 7 miles of the Ohio & Erie Canal, the group became prosperous and farmed over 5,500 acres of land and started weaving and iron industries. Today many buildings remain, some private, some as shops, and eleven as museums administered by the Ohio Historical Society. Work on your handicap at local golf courses, browse or buy your way through Westfield Shopping Town, Canton Center Mall or the Strip and there’s MUCH MORE! © 2019 Bear Creek Ranch KOA.